Not that mom didn't totally love your patented breakfast treats last year (what, carving her initials into a Luna Bar isn't sweet?! Chicks love those things, it says so on the label! 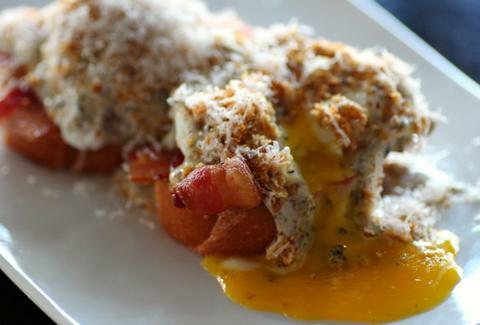 ), but this Mother's Day, whip her up this mind-blowingly delicious "Carbonara" Eggs Benedict from Eating House chef and Chopped champ Giorgio Rapicavoli. Best of all Giorgio's hollandaise-free, cheese-heavy version is bafflingly easy, sort of like your mom. Kidding! She's a queen. A drag queen! Kidding again! Whatever, just peep this easy-to-follow photo guide and make it.